Opposition MLAs today created ruckus in the Assembly trooping into the well of the House and shouting slogans over law and order in the state, before staging a walkout. PATNA: Opposition MLAs today created ruckus in the Assembly trooping into the well of the House and shouting slogans over law and order in the state, before staging a walkout. Trouble began after Speaker Vijay Kumar Choudhary rejected the notice of an adjournment motion by Lalit Yadav of RJD and Ramdeo Rai and Vijay Shanker Dubey of Congress, saying the House had important business to transact. Leader of Opposition Tejashwi Yadav requested the Speaker to admit the motion since it concerned "a very important issue". When the Speaker did not relent, some opposition members trooped into the well of the House and created a ruckus. Later, the RJD and Congress members staged a walkout. Earlier, during the Question Hour, Lalit Yadav sought the government's response to a report on illegal withdrawal of money in a district under the Mukhyamantri Nishchay Yojana. Panchayati Raj minister Kapil Dev Kamat said, "An inquiry committee has been constituted to look into the issue. Cases have been lodged against mukhiyas against whom complaints have been received." The district magistrates across the state were asked to go into any such irregularity, he said. 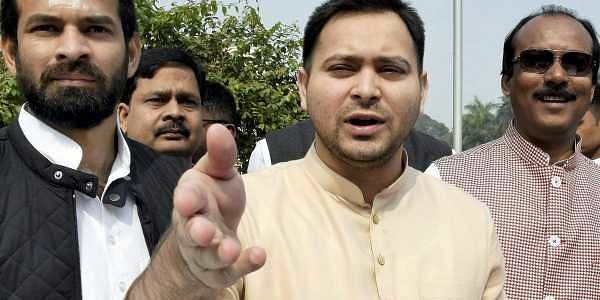 Dissatisfied with the minister's reply, Tejashwi Yadav said, "Corruption is widespread in the state. Officers have been trying to whitewash such irregularities. The chief minister should come to the House and clarify the position". Deputy Chief Minister Sushil Modi assured the members that the government "will not spare anyone involved in any scam, whether it was fodder scam, bitumen scam or Srijan scam". The guilty and the corrupt would be hounded out, no matter where they are hiding, he added. Tejashwi Yadav said the government should tell the House the number of senior officials and ministers against whom action has so far been taken. The opposition leader also had a heated exchange of words with Water Resources Minister Lalan Singh when, while mentioning various scams, he referred to the incident of a dam collapsing a day prior to its scheduled inauguration by Chief Minister Nitish Kumar.